As the price of a stock, a commodity or an index fluctuate, we observe certain levels where the price reverse its direction, and these levels are categorize as support and resistance by market technicians. How and what determine a potential support or resistance level varies. One of the common techniques most technicians employed is the moving averages. There are a variety of moving averages being use for monitoring potential support and resistance levels. They can be exponentially weighted or a simple weighted moving average and their period can be as short as 3 periods to 200 periods or longer. Since there can be unlimited number of moving average generated using different combination of weighting factor and period, how can one determine which moving average(s) to use? Unfortunately, there is no simple answer to this question. However, some moving averages have been popularized and are widely used. These moving averages are 10 periods exponential moving average (EMA), 20 EMA, 50 periods simple moving average (SMA), 100 SMA and 200 SMA. There are minor variations to these moving averages such as 9 or 13 EMA instead of 10 EMA, 21 EMA instead of 20 EMA, and 30 SMA instead of 50 SMA. Although there are some commonly used moving averages, they are not 100% reliable for detecting support and resistance levels. If these moving averages are improperly followed and used without context, one can easily get whipsaw. Here are some steps to take to improve the reliability of using moving averages for detecting potential support and resistance levels. First and foremost is to identify the current trend of the stock, commodity or index. Is the current trend up, down or sideway? If the trend is up, then look for potential support off the moving averages, and if the trend is down, then look for resistance from the moving averages. For sideway price actions, simply use the moving average to monitor for change is the price trend. From the chart for QQQ, notice the support off the rising 200 SMA at point A and the supports off the rising 20 EMA at point B & C. These supports are all from the context of rising moving averages. 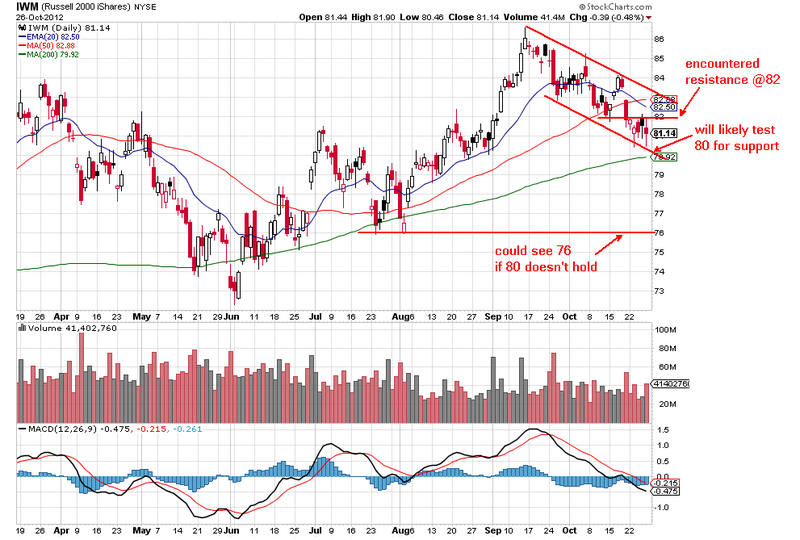 If the moving average is falling, then one will be looking for resistance levels from the moving averages. The price encountered resistance from the declining 20 EMA at point D. At point E on the chart, the price is consolidating near the 200 SMA and finding support from the rising trendline. Will the 200 SMA acts as support or will the price move below the 200 SMA and this moving average become future resistance? What do you think? Do not follow moving average blindly. Apply them with context. AAPL and AMZN are scheduled to report their quarterly earnings after the market close today. The latest projected price swing from the options market indicates a mininum of $32 and $19 for AAPL and AMZN respectively. and an update post earnings price move for $FB. What Price Level Will AAPL Go? 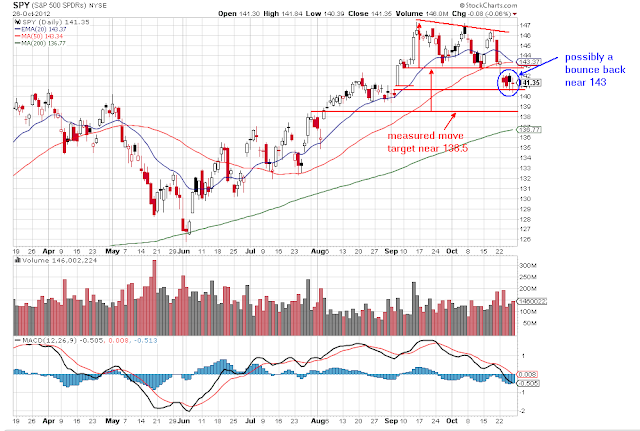 After reaching an all time high of 705.07, AAPL has retreated and gave back more than 13% from its high. Is this the correction for AAPL or will it go lower? Next Tuesday, 10/23/2012, AAPL will be announcing the highly anticipated Ipad mini, and then after the market closed on Thursday it will release its quarterly earnings report. These events will certainly bring some wild price movements. The key questions to be answered are "Will the Ipad mini be a game changer?" and "Will AAPL continue to deliver extraordinary financial performance?" Here is a look at what took place in the week just ended and some possible levels to keep an eye on. Click on this link to view the video if you do not see a video player on the screen. After Thursday's close, GOOG will be reporting its quarterly earnings and the options market is pricing it to move +/- $40. Here is a look at possible post ER price targets. GOOG is schedule to report its quarterly earnings after the market closed on 10/18/2012. Based on recent price actions, it appears to be priced for perfection. If the earnings report is less than stellar then a dramatic drop in the stock price should not be a surprise. 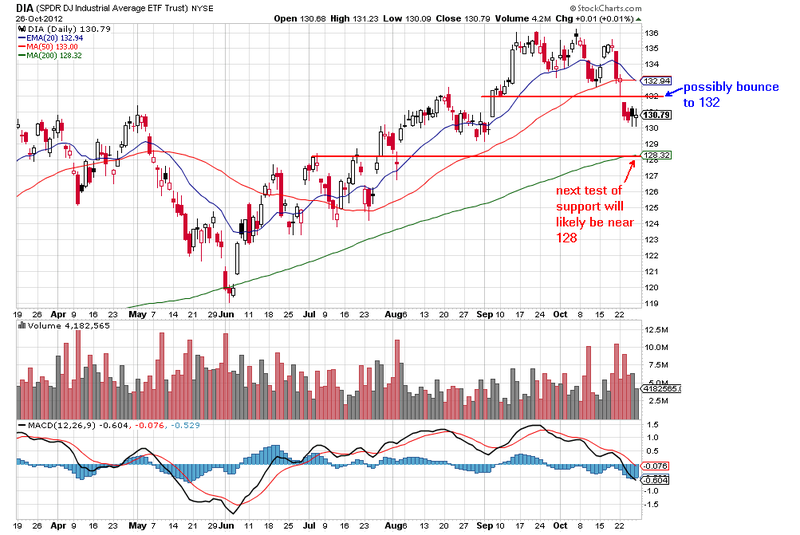 The market continues to pull back with increasing negative sentiments. 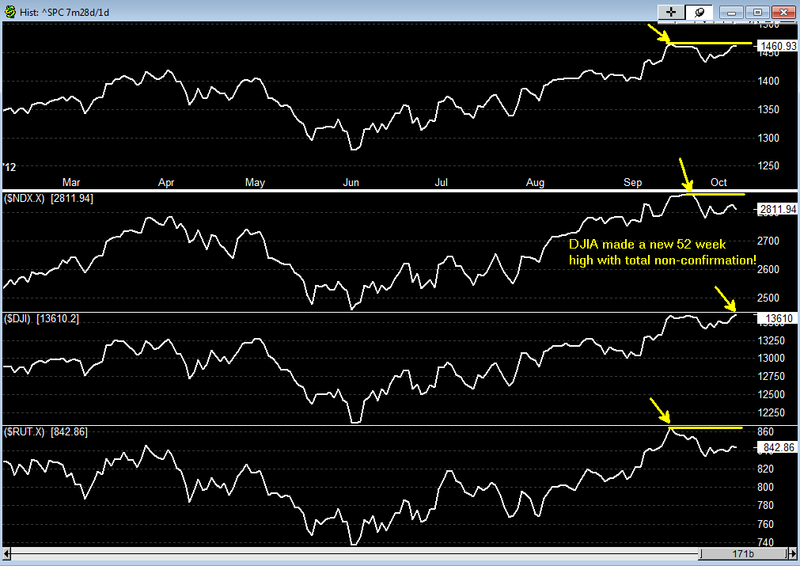 Ever since Oct 5, 2012 non-confirmed closing high from the DJIA, the market has headed down. Although the SP500 is still holding on to the 50 SMA, breaking the baseline of the double top price pattern does not bold well for this index. 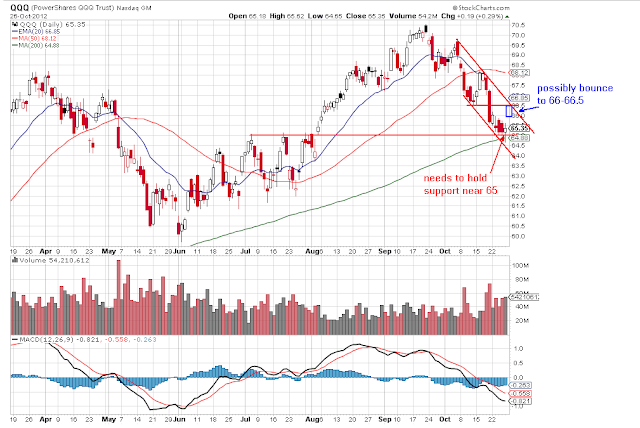 The nasdaq 100 and the Russell 2000 are under their 50 SMA with declining 20 EMA. Having GOOG earnings report due out next Thursday after the market close and next week is October options expiration week, the market is bound to experience some wild price movements. I will be very suspicious in the sustainability on any rally at this juncture. Click on this link if you do not see the video player on your screen. 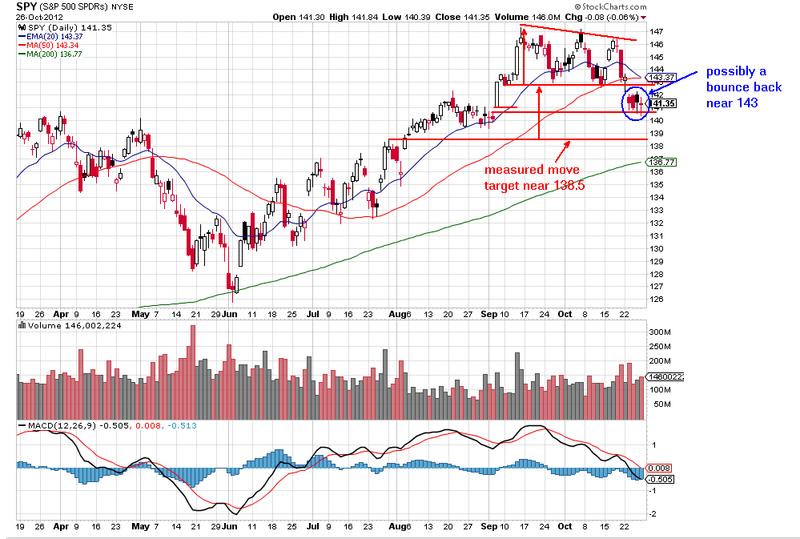 Here is a video depicting one of the possible scenario the market is playing on AAPL. Click this link to view the video if you do not see the video player on your screen. Today the Dow Jones Industrial index made a new 52 week high, closing at 13610.20 eclipsing the previous closing high of 13596.93 made on 9/20/2012. The difference between today's new high versus the previous new high is non-confirmation from all the other market indices: SP500, Nasdaq 100, Russell 2000, and the Dow Jones Transportation. This total non-confirmation is a sign of a market top. 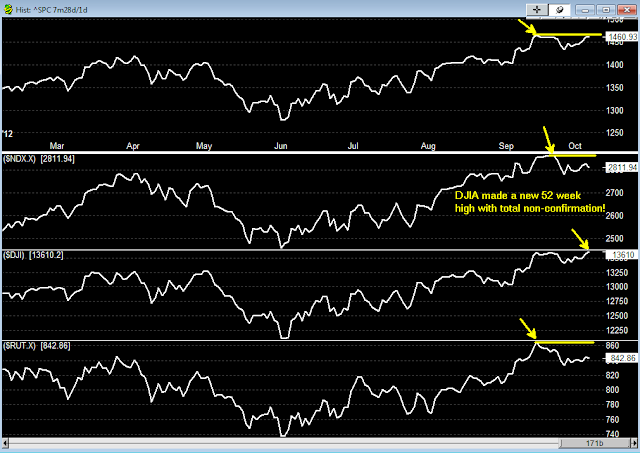 On the following chart, the yellow arrows highlighted the last high from each market index and notice the progression on dropping off from confirming with the DJI new high. 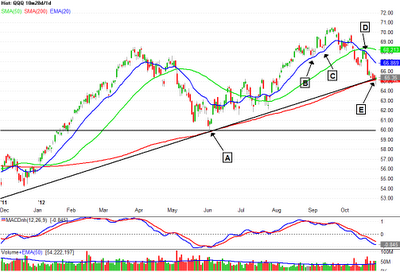 Until a major correction (trend reversal move) has occurred, I will be either on the sideline or on the short side. The market is still trying to find support. 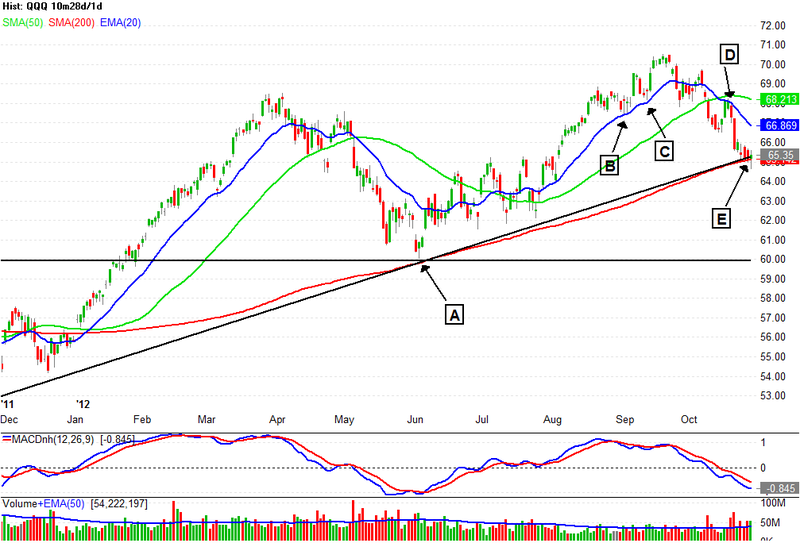 Unless the SP500 closed above 1450, the near term continue to look negative. Watch the video to see where the support levels for the market. Interesting day for AAPL. 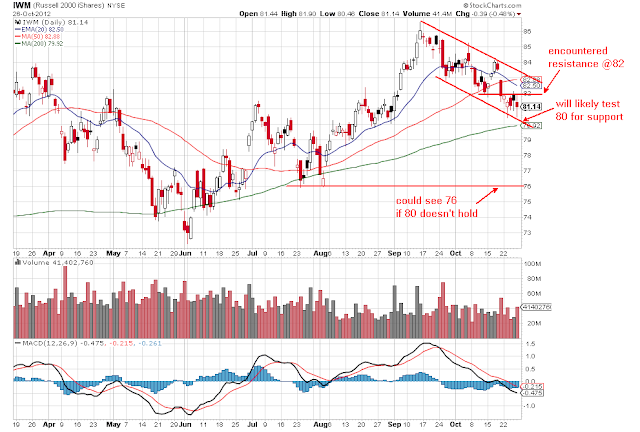 It appears to have found some buyers near the 50 SMA...could be a trap for the dip buyers. Here is a video reviewing today's price actions.